Radial tire with automotive-grade tread has an 8-ply rating and a 2,540-lb max load at 65 psi. 15" x 6" Steel wheel undergoes an eco-friendly PVD coating process for extreme corrosion resistance. Complimentary roadside assistance included. Lowest Prices for the best tires and wheels from Taskmaster. 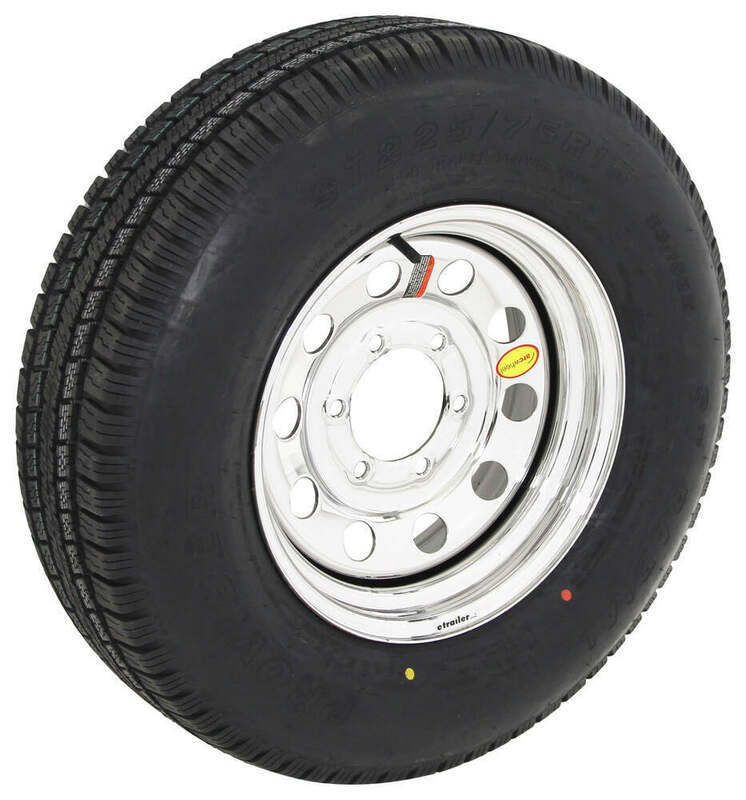 Provider ST225/75R15 Radial Tire w/ 15" Steel Mod Wheel - 6 on 5-1/2 - LR D - Silver PVD Finish part number A225R6SMPVD can be ordered online at etrailer.com or call 800-298-8924 for expert service. Today we're going to be taking a look at the TaskMaster Provider, ST225 75R15. 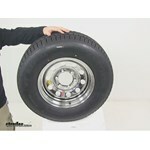 This is a radial trailer tire with a 15 inch steel mod wheel. 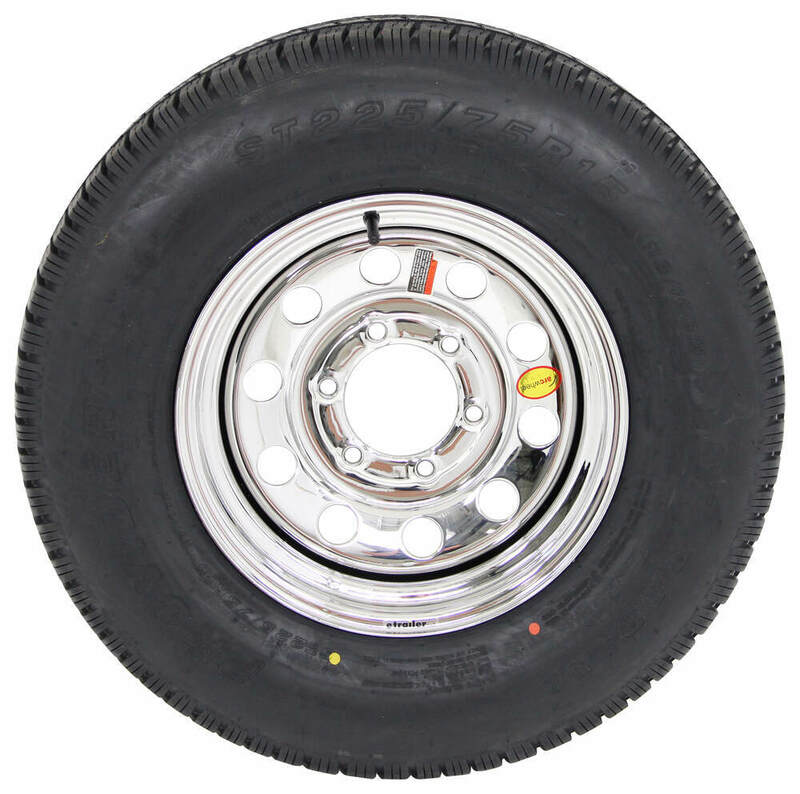 The tire and wheel assembly is going to be ideal for boat trailers, stock trailers, utility trailers, and campers. The sturdy steel wheel has a modular design. That's simply just these round holes that are around the wheel. It gives it a really nice look. The thing that's really unique about this combination of the tire and wheel, but mainly focusing on the wheel, is going to be the coating process that's on the wheel. It's going to use PVD which stands for physical vapor deposition. That's a process that creates a sleek, silver finish that is harder and more durable that chrome plating. It's a tough, wear-resistant coating that won't pit or peel. It's going to offer excellent corrosion resistance. It actually has a salt-spray rating of more than 168 hours, and the whole process is environmentally friendly. The technique simply binds the coating to the wheel at a molecular level. That's going to be on the front and on the back, but here at the back around the lug holes you can see that it does not have a coating. That's simply because the wheel is going to use ITR technology, that's improved torque retention technology. That's going to help keep the wheel securely in place on your trailer. The stud holes are beveled to offer better clamp force retention. Now, the tire is constructed with double steel belts and double polyester cords for a nice long life. 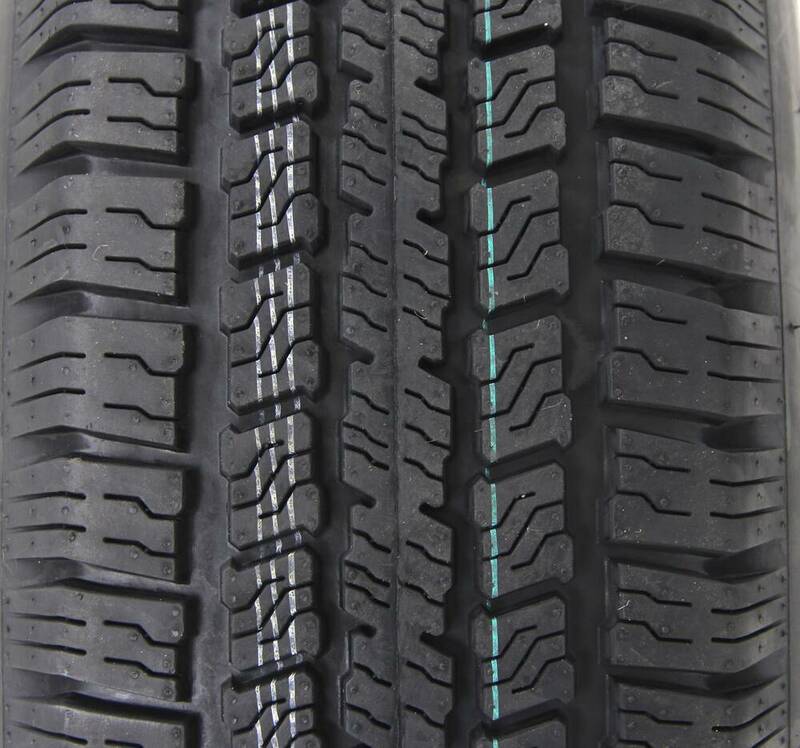 It's going to feature nylon tread forming belt overlays to help prevent tread separation, and it's going to have our tread depth bars that offer a quick visual indicator of tread wear. The assembly meets Department of Transportation specifications and exceeds FMVSS. The rim dimensions, it's going to give us a diameter of 15 inches with the width of 6 inches. Bowl pattern on the unit is going to be 6 on 5 and a half. That's going to use a wheel lug size of a half inch by 20, and the wheel capacity is 2,830 pounds. It's going to give us a pilot hole diameter of 4.25 inches. Again, the tire size is going to be printed right here on the outer wall that says ST225 75R15. It's going to offer a section width of 8.78 inches with an outer diameter from top to bottom when fully inflated of 28.31 inches. 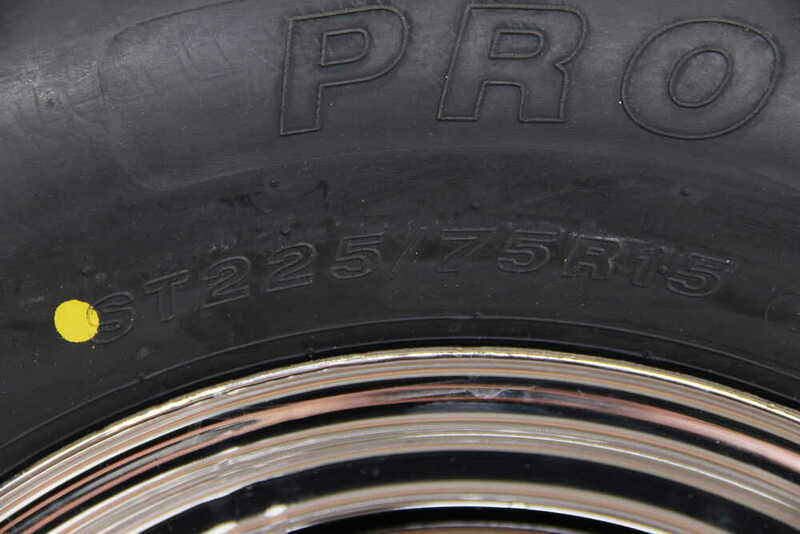 When it comes to the tire capacity, we're looking at a load range D with an A ply rating, and a maximum load on the tire is 2,540 pounds at 65 PSI. One of the last things I want to mention is that tires now have speed ratings. You can find out the speed rating by locating the tire size and then going a little bit past it. 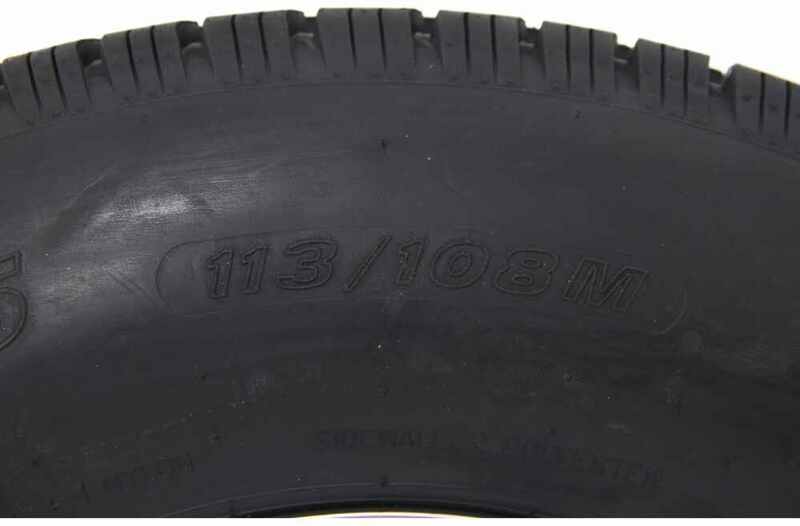 On this particular tire it says, "113 108M." The M is our speed rating. M stands for maximum speed of 81 miles per hour. Baht's going to do it for today's look at the TaskMaster Provider ST225 75R15. Order: RelevanceNewestRating - High to LowRating - Low to High Radial tire with automotive-grade tread has an 8-ply rating and a 2,540-lb max load at 65 psi. 15" x 6" Steel wheel undergoes an eco-friendly PVD coating process for extreme corrosion resistance. Complimentary roadside assistance included. The wheel and tire you are looking for is the part # A225R6SMPVD. 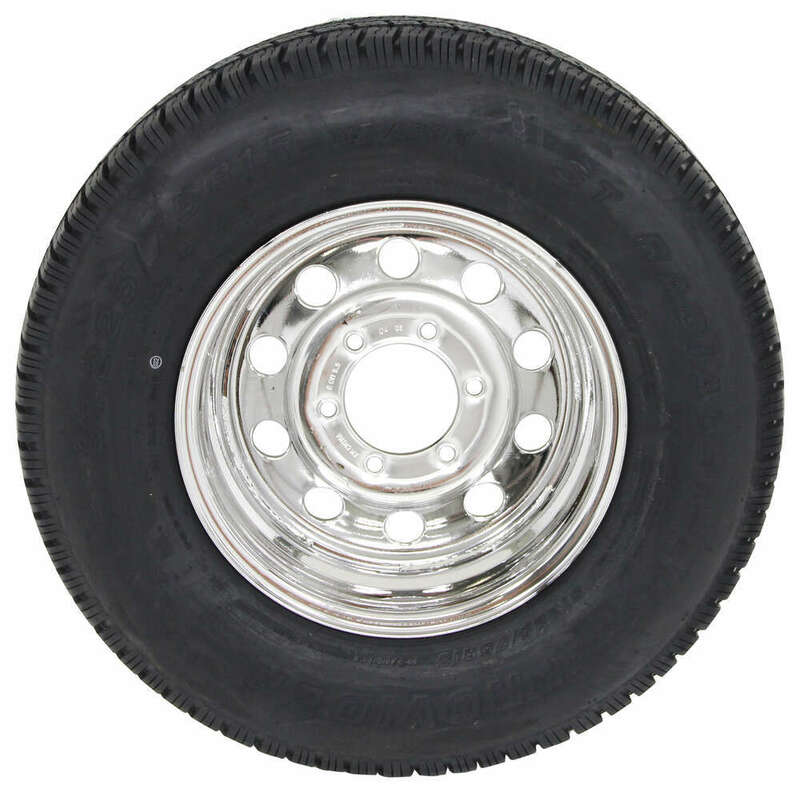 This has the PVD/Chrome wheel # 560655MSPVD with an ST225/75R15 tire mounted to it. Check out the review video I attached below for more info. The tire has a capacity of 2,540 lbs at 65 psi and a speed rating of 81 mph.